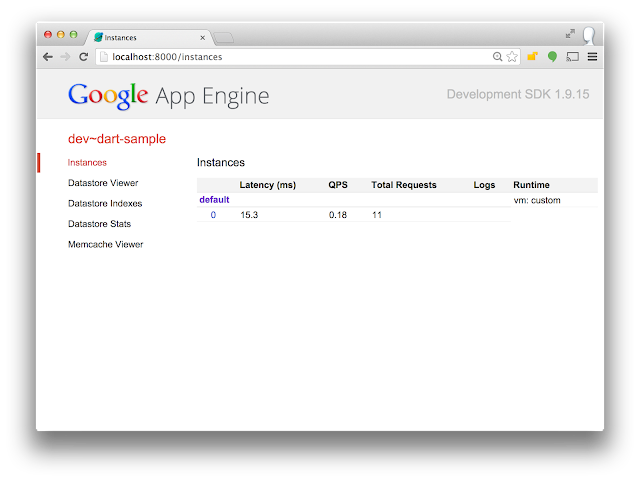 Today you can develop and deploy Dart server applications that run on the Google App Engine Managed VMs beta. The productivity of the Dart language and libraries are a great fit for server applications. You get the competitive performance of the Dart VM while leveraging powerful tools like Observatory–all while easily sharing code with your browser application. Now you can try Dart on Google App Engine, which lets you build and run applications on Google’s infrastructure. App Engine applications are easy to build, easy to maintain, and easy to scale as your traffic and data storage needs change. With App Engine, there are no servers for you to maintain. You simply upload your application and it’s ready to go. Managed VMs extend App Engine to support user-defined custom runtimes. The Dart team is building on custom runtimes to allow you to easily develop and deploy Dart server applications that run on Google’s infrastructure. Once you have set up your local development environment, you can quickly write and test your Dart server application using simulated App Engine Services–Datastore, Memcache, Logging, and more–on your development machine. A local admin interface gives you direct access to the services on the running instance. We’ve created several samples to get you started. When you’re ready to deploy, App Engine gives you control over your application resources. You can also easily configure it to allow your application to automatically scale up and down in response to traffic. Once your site is live, you can monitor and manage your application using the browser-based Google Developers Console. The Dart packages we are releasing today are beta, so we’d love your feedback. To participate in the discussion on running Dart on Managed VMs, and to stay informed with news and announcements, sign up for the Dart cloud Google Group. We are looking forward to your feedback so we can improve your experience with Dart and Google Cloud Platform. To get started, visit dartlang.org/cloud.